Hi guys, how's it going today? Beautiful weather we're having here... is what I wish I could say. It's raining, again. I hate the rain so much. My car has a leak so whenever it rains I get huge puddles on the inside. It's just a whole lot of not good. I hope you guys have been having better weather. I'm in Jersey, for those who might be wondering. I'm exactly one week away from having a week off from work so let's hope the weather is better by then. If you follow me on Instagram, then you'll know that I created month long #bestietwinnails with my bestie @cdbnails143. For the month of June we decided that we would make our own challenges based on our favorite movies and shows. 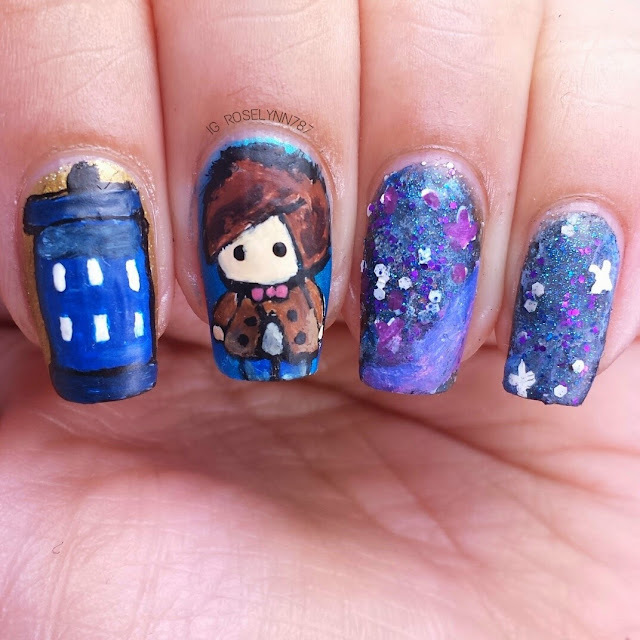 For Day 1 of our challenge, we chose something that bonded us early on in our friendship: Doctor Who! The chi-bi version of the 11th Doctor! If you don't know, chi-bi in Japanese culture refers to a small person or child. In anime artistry, it has become a popular style in which to draw a character to symbolize cuteness and/or humor. As a huge fan of anime and manga, I love drawing chi-bi versions of my favorite characters. This was the first time that I tried to do it on my own nails. Talk about rough! This design took me a total of about two hours straight, most of he time was spent on the Doctor himself. It required very fine tiny lines, which you guys know I'm not strong at. I used polish for the base color under the acrylic paint for the phone box and the doctor, though you can barely tell. 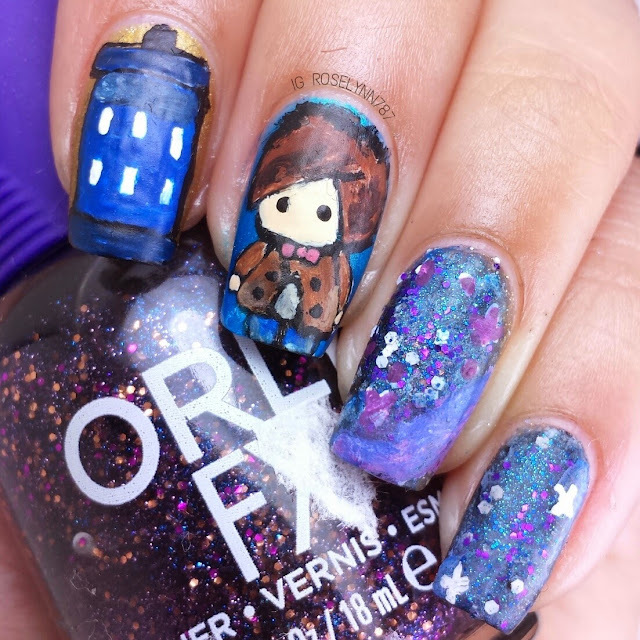 I also used Orly FX Intergalactic Space for the ring and pinky galaxy look (mostly for the glitters). Everything else was created using plain ol' acrylic paints like usual. If you guys want specific details on any of that, as always, just let me know down in the comments. Even though I'm extremely happy with how my little Doctor came out, I have to say I hate the way the phone box is. I wanted to write the words across it but my brush was having none of that. Still not an overall bad mani if I do say so myself. I was thinking of doing a tutorial for galaxy nails, if anyone is interested. I won't tell you guys what the theme for the next mani is but it will be up over the weekend, as well as, a post about removing glitter polishes. Stay Tuned. Love you guys! Well done!! 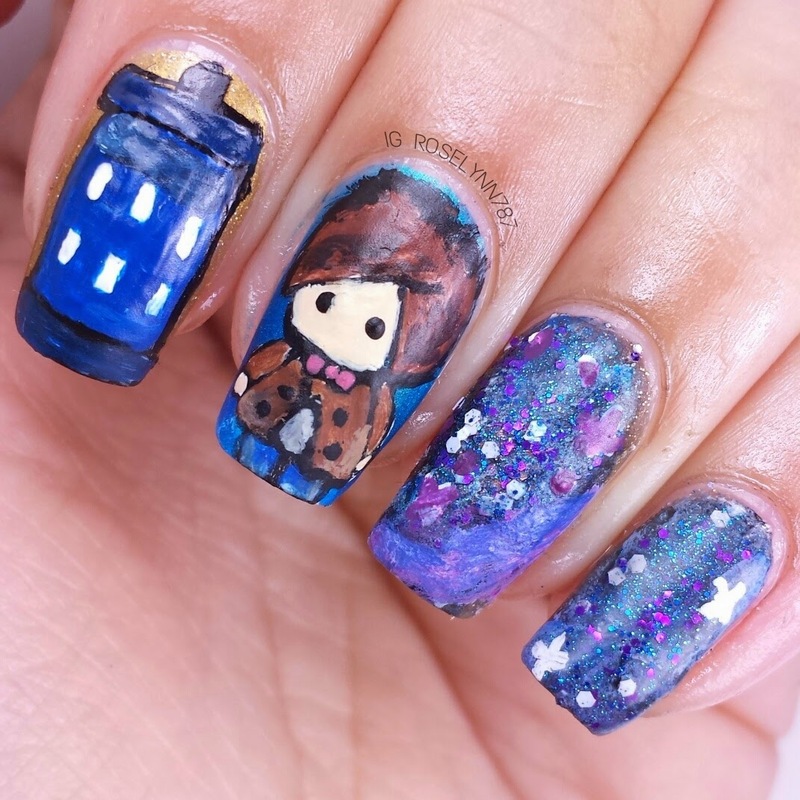 This mani is adorable!